Here are some of the media mentions you will find about our work. We have been considered SEO experts in our since 2003, and this is why the media come to us when they need to find out what SEO is all about. Our digital specialist David Cannell was interviewed by Mike Jeffreys about why reputation management matters for both individuals and companies. 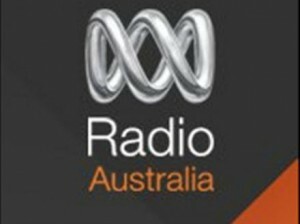 David discusses with Ben Fordham why online reputation management is growing and how it works. Listen to them discuss how this could be hurting YOU. 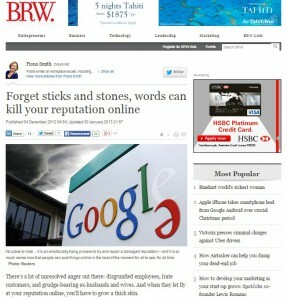 Interviewed by the Australian Financial Review on what is happening online and how it can damage your reputation. 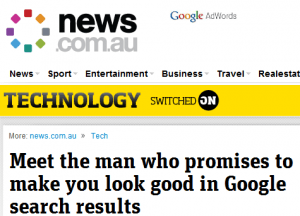 “Meet the man who promises to make you look good in Google” reads the headline! This was the first big news story that broke in Australia relating to Online Reputation Management. It involved big time sports stars and our reputation management specialist was called in as the “go to” expert to discuss how companies are cleaning up reputations online. This was really the first story of its sort in Australia on the subject and opened the floodgates on how big this issue is. Read the full story here. More on why sports stars often pay to clean up there online reputations.